Hello everyone! I hope you are doing well. Today's article is about the best items to get from the store MAWI in the Starplaza. MAWI is for Beauty Parlour and is very modern and unique jewelry. MAWI is a real brand store based of the brand of the same name. MAWI is a jewelry line from London, UK. The brand name comes from the founder and Creative Director Mawi Keivon. MAWI was launched at the 2002 London Fashion week. MAWI has become a very popular brand for luxury fashion jewelry. 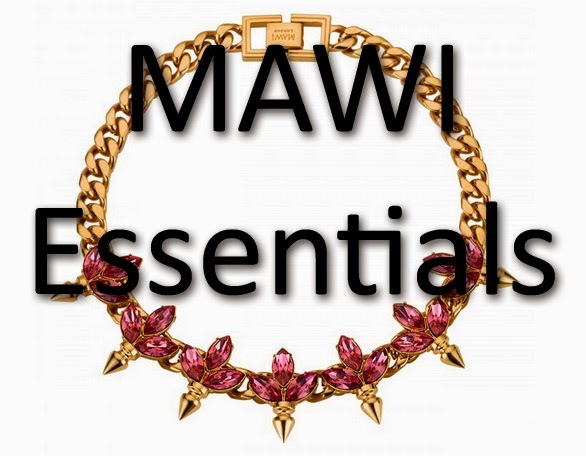 The essential items to get from MAWI is the gold coloured "Dynamite" design necklaces, bracelet and earrings. They are plain gold and can go with almost anything. They add a unique twist to your outfit. Also they are a reasonable price. Here are 2 outfits demonstrating how to use the "Dynamite" design items. For the first outfit I wanted to demonstrate how to spice up an outfit even more with MAWI jewelry. I used: 'Triple Dynamite Bauble Necklace' from MAWI, 'Dynamite Dome Earrings' from Mawi, 'Multi Dome Dynamite Bangle', 'HotBuys General Jacket' from Hot Buys, 'Basic White Short Top' from Basics, 'Red Miniskirt' from Basics, 'Pearls Pochette' from Zuhair Murad Tribute and 'HotBuys Platform Hikers' from Bonjour Bizou. The second outfit I wanted to demonstrate how to add a bit of cute detail to my outfit. I used: 'Multi Gem Encrusted Ring' necklace from MAWI (they must of had a glitch because that is what the tag says), 'Dynamite Dome Earrings' from MAWI, 'White Classic Top' Special Offer, 'New Year Fireworks Skirt' from Hot Hotbuys, 'T-strap Platforms' from PPQ. I used: 'Daisy Gemstone Earrings' from MAWI, 'Sparkle Stripe Knit Dress' from Tommy Hilfiger Tribute, Stardesign tights and 'Lace Up Boots' from Front Row. MAWI has many unique qualities and it was hard to write an article about all of them equally, including the rings, bracelets and gem clutches. So I'm sorry to disappoint if you were expecting to see those features. I hope you enjoyed my article today. Have a great week! I hope this article has inspired you to make outfits using items from MAWI jewelry.